A recent report published by Infinium Global Research on cardiac holter monitor market provides an in-depth analysis of segments and sub-segments in the global as well as regional cardiac holter monitor market. The study also highlights the impact of drivers, restraints, and macro indicators on the global and regional cardiac holter monitor market over the short term as well as long term. The report is a comprehensive presentation of trends, forecast and dollar values of global cardiac holter monitor market. According to the report, the global cardiac holter monitor market is projected to grow at a CAGR of 6.7% over the forecast period of 2018-2024. A cardiac Holter monitor is a type of portable ambulatory electrocardiography device. It is a battery-operated device that measures and records the heart’s activity continuously for 24 to 48 hours. This noninvasive test device uses electrodes that are taped to the patient’s chest to check the heart's rhythm. It monitors the heart's rhythm and displays it on a chart called an electrocardiograph. The Holter monitor consists of a monitor, electrodes, and software for review and analysis of the record. Cardiac Holter monitor allows a doctor to observe the patient’s heart functioning over an extended period in order to diagnose conditions related to irregular cardiac rhythms such as Arrhythmia, Tachycardia, and Atrial fibrillation. The increasing demand for a holistic, multi-input, and patient-driven device that takes into account the complex physiology of a patient has led to the invention of a wearable heart monitor powered by artificial intelligence. U.K.-based startup Cambridge Heartware has announced the launch of a wearable heart monitor powered by artificial intelligence, in early 2019 that wirelessly streams any data that the device picks to the cloud, where adaptive AI algorithms identify clinically relevant irregular rhythms. The rising prevalence of coronary heart disease owing to unhealthy diet, physical inactivity, tobacco use, and harmful use of alcohol drives the cardiac Holter monitor market. There is a significant rise in the number of people suffering from irregular heart rhythm conditions such as Arrhythmia, Tachycardia, and Atrial fibrillation. Arrhythmia and Tachycardia are the relatively common entity that affects 570,000 people in the United States with an estimated 89,000 new cases reported annually. Doctors use this device to examine the effectiveness of the treatment from medication or a pacemaker in patients with Arrhythmia, Tachycardia or other cardiac diseases. In addition, a large part of the population is aging rapidly and their increased vulnerability to several chronic heart diseases drives the cardiac Holter monitor market. Furthermore, the rising focus on preventive and diagnostic healthcare contributes to the growth of cardiac Holter monitor market over the forecast period. The significant investment in research and development has led to the evolution of the wireless cardiac monitoring devices that are smaller, water resistant and avoid the nuisance caused by traditional Holter monitors. However, the high cost of the device hampers the growth of cardiac Holter monitor market. Moreover, the increasing rate of adoption of new noninvasive medical technologies creates opportunities for the growth of the cardiac Holter monitor market. Geographically, North America is the dominant region in the cardiac Holter monitor market. 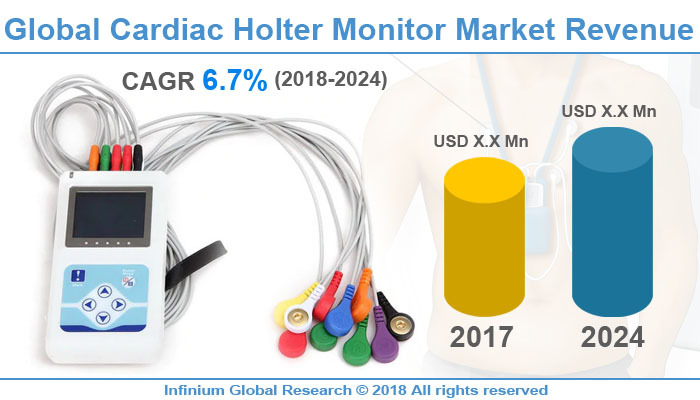 The high rate of adoption of medical devices and the increase in sedentary lifestyle in North America region promotes the growth of the cardiac Holter monitor market in this region. Europe is the second largest region in the left ventricular assist device market as a large population in this region is affected by coronary heart diseases. Asia Pacific regions are set to grow with an incredible pace in the cardiac Holter monitor market owing to the rising incidences of heart diseases and increasing aging population in this region. The report on global cardiac holter monitor market covers segments such as components, product, and end-users. On the basis of components, the sub-markets include wired holter, wireless holter, holter analysis system, and holter software. On the basis of product, the sub-markets include 1-channel, 2-channel, 3-channel, 12-channel, and others. On the basis of end-users, the sub-markets include hospitals, homecare settings, clinics, and ambulatory surgical centers. The report provides profiles of the companies in the market such as ScottCare Corporation, GE Healthcare, Spacelabs Healthcare, FUKUDA DENSHI CO., LTD., Nasiff Associates, Inc., Schiller AG, Biomedical Instruments Co., BTL, and Koninklijke Philips N.V. The report provides deep insights into the demand forecasts, market trends, and micro and macro indicators. In addition, this report provides insights into the factors that are driving and restraining the growth in this market. Moreover, The IGR-Growth Matrix analysis given in the report brings an insight into the investment areas that existing or new market players can consider. The report provides insights into the market using analytical tools such as Porter's five forces analysis and DRO analysis of cardiac holter monitor market. Moreover, the study highlights current market trends and provides forecast from 2018-2024. We also have highlighted future trends in the market that will affect the demand during the forecast period. Moreover, the competitive analysis given in each regional market brings an insight into the market share of the leading players.